My mother bought this bike for my Birthday last year and I love it. I take it out to forage on the back country roads and to explore almost weekly when the weather is nice and it rides well, love the little basket to hold my goodies i take along and the water bottle holder is awesome ! It also has a rack over the back wheel, I have a 2nd wicker bike basket that i hang from the one side for additional carrying space. Useful when your gathering wild ramps, wild apples, asparagus and wild nuts ! Great bike for anyone ! 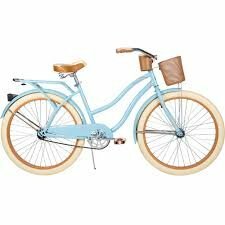 This bike is so cute!! I love the style of this bike! I love this bike. You are so lucky that you have somewhere to ride it.